Borders apart from being decorative are useful if your fabric is not wide enough for the window. Always try to get a contrast fabric of the same weight as your main fabric. 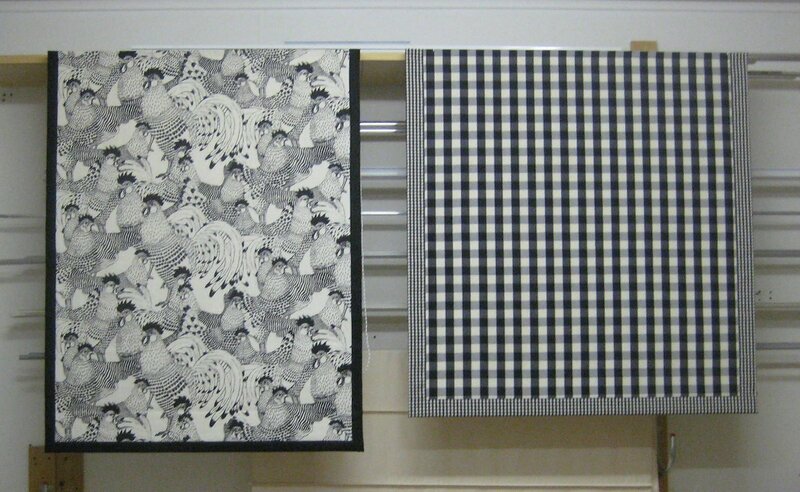 Allow 20 cm of contrast fabric x width - the image below shows a plain blind with a gingham border. Allow 2 x strips of 20 cm wide contrast fabric x length + 30 cm - the image below shows a remade blind that wasn't wide enough so contrasting borders were added. Allow 2 x strips of 20 cm wide x the blind length + 30 cm and 1 x strip of 20 cm wide the width of the blind + 20cm. The bottom border will hang below the folds when pulled up taking up more space when the roman blind is up, please state if you wish the bottom border to be in line with the other folds when up. The border is normally about 5 cm wide, if you would like wider borders state the width and send enough fabric for making the wider strips.